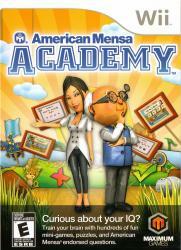 American Mensa Academy� provides genuine American Mensa� questions so you can find your true American Mensa score! Test a little low? Improve your skills and try again! Featuring exciting theater backdrops and brain-twisting tests, American Mensa Academy� is the most stimulating way to improve your IQ! Immerse your brain in mini-games and puzzles that cover topics like: Literacy, Numeracy, Logic, Memory, and Visual & Spatial skills. Choose from three exciting game modes to enhance your learning experience. Questions are posed as fun challenges with humorous characters and colorful graphics that will have you pushing for the win!